Replacement LED light bulbs in Color or White light - easy to retrofit. Use these bulbs made by J&J Electronics or Pentair to convert your current pool light into an energy saving light with several colors and light show options. LEDs (Light Emitting Diodes) are solid-state lighting that use chips from semiconductors instead of a filament, gas or vapor to produce illumination. 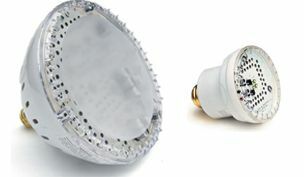 Unlike conventional lighting technologies, LEDs do not rely on “bulb technology”, which means they last much longer and use far less energy than any light bulb. Color-changing pool and spa lights that feature LED technology are the wave of the future in energy efficiency, lifetime value, quality of light and controllability. With color changing lights, combinations of individual colored LEDs are mixed and matched to achieve a vibrant spectrum of colors. These combinations are power sequenced to illuminate and cycle through colors at varying speeds, and in different sequences of color. LED technology is the brightest and most responsive lighting system ever, so your pool will come alive. LEDs are extremely efficient and can save up to 79% on energy costs when compared to traditional pool lighting. The streamlined, sealed units are watertight and easy to install. There are no bulbs to change, no color wheels, and no moving parts for noiseless and service-free operation. LED products are low-voltage lighting. This makes LEDs up to 90% more energy efficient than other lighting, such as incandescent and halogen. Lower power consumption lowers operating costs. Using LED lighting in place of incandescent or halogen lighting will reduce energy costs. Because LED lighting consumes less energy, it generates very little heat. In comparison, an incandescent light dumps approximately 90% of the energy it consumes as heat, making the bulbs hot. Heat drastically reduces a light’s lifespan. Because LED lighting generates very little heat, its lifespan far exceeds that of conventional lighting. The life of a single LED light can last up to 100,000 hours. This is significantly longer than the 1,500 hour maximum life of a standard light bulb. LED's amazingly long life considerably reduces consumer inconvenience and maintenance costs because it rarely needs replacing. LEDs operate without glass bulbs, delicate filaments, or complex tubing. This makes LED lighting far more shock and vibration resistant than incandescent or halogen lights. With LED pool and spa lighting, it’s easier and less expensive to build displays underwater and in outdoor environments where there is vibration, dust or wind. LED lighting does not contain mercury or produce EMI emissions; just another reason why LED lighting is an Earth-friendly, or “green” lighting solution.